HMDT Music Welcomes You To The Saturday Programme! The purpose of this Handbook is to provide you and your children with an easy to use guide whilst studying at the Saturday Programme. 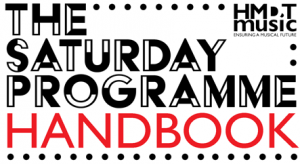 This booklet should help to answer many of your questions throughout the year and provide you with a comprehensive overview of the programme to help make your time at the Saturday Programme as productive and enjoyable as possible.